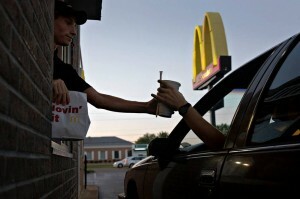 Fast-food, construction to feel effects of labor board decision on temp and contract workers. Contract workers and other temporary employees will be able to more easily unionize following a landmark ruling Thursday by a U.S. federal labor regulator. The ruling from the National Labor Relations Board will ripple through the fast-food, construction and other industries that rely heavily on contract workers and employees of franchisees. Previously, such companies were considered by law to be a step removed from many of their workers when certain labor disputes arose. The decision, which came in a 3-2 vote on a single case before the board involving sanitation workers, is the latest to attempt to tackle the core question of who counts as an employee in a modern economy that is increasingly reliant on shift work, contract workers and other temporary employees. The Labor Department, for example, has been cracking down on companies it says misclassify employees as independent contractors to avoid paying taxes, overtime pay and benefits. Uber Technologies Inc. is facing such accusations by drivers in California that the company has disputed. Meanwhile, the NLRB has pending cases that claim franchisers such as McDonald’s Corp. should be held responsible for alleged labor law violations at independently owned restaurants. Many businesses have fiercely opposed the change, and not surprisingly. Companies increasingly have been turning to temporary contract workers, a business model that gives them more flexibility to add or shed workers as needed. “If this decision stands, the economic rationale for hiring a subcontractor vanishes,” said Beth Milito, senior legal counsel for the National Federation of Independent Business. “It will make it much harder for self-employed subcontractors to get jobs and of course it will drive up operating expenses for the companies that hire them.” Union groups, meanwhile, have complained to regulators that many businesses exercise control over the pay and working conditions of certain workers but shirk their duties by refusing to claim them as employees.